The CoffeeShop Blog: Preview of CoffeeShop B&W LR2 Presets! 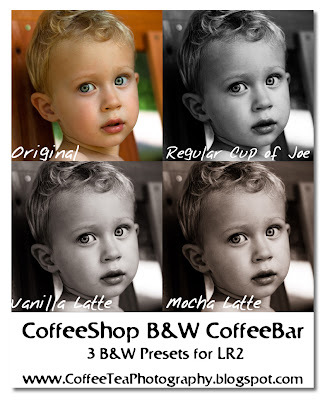 Preview of CoffeeShop B&W LR2 Presets! Aren't dandelions beautiful? When I lived in the city the site of a dandelion in my perfectly manicured lawn would give me a mini heart attack, but now I can enjoy them out in our field. The sight of thousands of dandelions waving in the setting sun is spectacular! Textures used in this image were from Playing with Brushes . You all (Ya'll for my fellow Texans) have been so enthusiastic about my LightRoom 2 post . I never realized I had so many Adobe Photoshop Lightroom 2 users out there reading my blog. Well, I am now inspired to start doing LightRoom2 tutorials and writing some free presets to share with you. Below is a preview of my first CoffeeShop LR2 Preset set. I absolutely hate the low contrast B&W preset that comes with LR2, and the high contrast B&W is not much better. So today I wrote three B&W conversions that I absolutely love. They all have high contrast, but you can easily make tweaks. There is a classic B&W, vanilla B&W (my favorite! ), and a mocha brown B&W. As this is my first LR2 preset set, I would love to hear your comments on them. I will post them in a day or two (just making final tweaks). If any of you know how to make Photoshop ACR Presets, please let me know (or post a link). I want to make an ACR version for the Photoshop users out there. Unfortunately PSE users can't use ACR or LR2 presets, but don't worry, I will have plenty more goodies headed your way! Oh, I am now Twittering if you can believe it. I won't be updating you on what I had for dinner or the movie I happened to be watching or what my kids decided to dig up and eat in the backyard (how BORING), so don't worry. ;-) I will mainly just keep you posted on photography and photo-editing tips and comments about past/present/future posts here. So if you want to be first in line to find out when I am releasing new CoffeeShop Stuff, just follow me on Twitter! Will the LR2 presets work in the previous version of LR? I have never used LR presets (beyond what it comes with), but would love to try some- but don't have LR2. Thanks for your fabulous blog- I love it! I'm SO EXCITED for these!! I too hate the b&w presets and always have to change the exposure and then just end up with dark faces. Have we mentioned that we LOVE you today? ;) Just checking! I adore LR 2 and all of your stuff for PSE! I cannot wait to see what you come up with!! I really love those 3 Versions! Great Job! I can´t wait to try them! Thank you so much! How exciting I can't wait! I really need those tutorials for skin, eyes, etc! Thanks Rita! Hey I ws just wondering if Playing with Brushes was an actual site that you could get the actions off of?